Cheyenne Mountain, the company that still hasn't brought you Stargate Worlds, has announced Stargate: Resistance, the next videogame in the Stargate franchise that could also end up being the first. Cheyenne Mountain and MGM announced the Stargate Worlds MMOG all the way back in February 2006 but by late 2008 the company was struggling financially and that the game itself was in doubt. Things didn't get better in the new year; in March Cheyenne Mountain was sued by an Arizona data center for unpaid bills and then in April, Stargate: SG-1 Executive Producer Brad Wright implied that the project was dead and buried, calling it a "waste." Then in July, as if things weren't bad enough, a former employee of Stargate Worlds publisher Firesky (a trademark of Cheyenne Mountain Entertainment) claimed that Cheyenne would lose the rights to develop the game if it didn't have new funding in place by the first of August. That claim was denied by Firesky's Shane Hensley, who said he had no indication that MGM was ready to pull the plug. There's been silence on the Stargate Worlds front since then and the general assumption seems to be that if the game is still alive, it's only just barely. So I can't help find it a little bit odd that the company has announced an all-new Stargate game called Stargate: Resistance, a third-person action game that pits Stargate Command against the System Lords in real-time online battles. 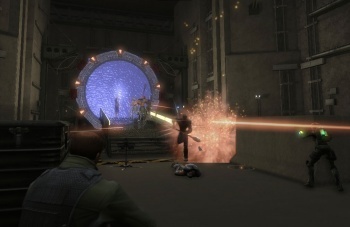 Players will be able to fight as a Soldier, Commando or Scientist for the SGC or Jaffa, Ashrak or Goa'uld for the System Lords, with each class bringing a unique arsenal of weapons and items to the fight. The game will feature "fluid team-centric play, fast-paced real-time combat and wonderful maps designed specifically to bring these two sides into conflict through dynamic hand-to-hand and ranged combat." So what's the deal with announcing a new game while the troubles surrounding the old, still-unreleased game remain unresolved? Creative Consultant Chris Klug worked a bit of a mea culpa into the game announcement. "As well as building this new exciting product, paramount to Firesky's long-term future is restoring your confidence and trust in us. While we've never lied to you about our circumstances, many times we were silent while our critics had their fun at our expense," he said. "We chose to remain quiet during those times, because, honestly, we often didn't know what our future was day-to-day, sometimes even hour-to-hour. As a group we chose to not say anything until we knew something." "Moving forward, think of our relationship as one we need to re-build," he continued. "Imagine this conversation is the first one we have over a cup of coffee in Starbucks where I ask you to give us a chance to restore what we had and enjoyed together." That may possibly be the weirdest thing I've ever read in a new game announcement, but nonetheless I hope the guys at Cheyenne are able to pull it off. The Stargate: Resistance FAQ says the game is currently in the "polishing stage" and will be released in the first quarter of 2010, exclusively for the PC. We've reached out to Cheyenne Mountain to see what this portends for the future of Stargate Worlds; in the meantime, you can learn more about this new Stargate game at the new Stargate: Resistance website.